Thread: Help, can this be saved? My Grandmother died last year and my mother has asked me if I can do anything with this quilt top she had made. I would like to try and salvage and/or repair it and finish it but have No Idea what to do. Does anyone have any ideas on what could be done? the quilt conservator that spoke at our guild meeting said that quilts/tops like this need a top layer of tulle/netting and then quilted as normal. try to find off-white/cream tulle for this one. I wouldn't want to see the holes in it, if it were my quilt. The sashing seems to have the worst damage and needs to be changed out, but it would be very difficult to find old blue fabric that is that soft and worn. What you might do is remove one row or one column, and use the sashing pieces from it to switch out the real holey ones. (Making the quilt smaller.) Then the tiny holes in the white part can just be darned with something white behind them. I've repaired lots of quilt and this is what I'd do. I also have declined repairing some that would have taken the rest of my lifetime to repair. You have only shown us a couple of spots on the quilt that are badly damaged. If the damage is more overall, my idea won't work. In that case I'd just remove the butterfly blocks that are still in good shape, and put them together some other way. You'll still be keeping a part of your grandmother's work for your mom to enjoy. New sashing with 30's reproductions would be cute! Last edited by sewbizgirl; 05-04-2018 at 02:23 PM. I would love that quilt top so meaningful but then again I had been my Nanny’s Dollface. One idea, if it were mine, would be to line it with muslin and appliqué over the holes, add thin batting, the backing and quilt it . I haven't repaired any quilts yet. All I can say is good luck. It looks like most of the butterfly blocks are okay. I would look for similar blue and pink to replace the sashing and cornerstones. I would then trim out as many useable blocks as possible, square them and resew the top. They look like mostly 1950/60 fabrics so their value would be sentimental over historical in my opinion. I think I would hand applique over the holes -- maybe bees and a beehive. You might be able to find a fabric that has bees and hives that you could cut out to use. Although it would be done by hand, I think this would be a lot less intimidating than taking the quilt apart to replace the sashing. It would also leave the quilt in a more original state. Because the fabric is quite old, I would also either line it with a thin washed muslin or cover it with tulle as QuiltnNan suggested. Either of these (or both) would extend the life of the quilt. I would probably use Quilter's Dream Request cotton for the batting to keep it thin and light in weight (not too puffy). Edit: Appliqued flowers would work too to cover up the holes. I agree with Tartan. This is an unquilted top, so easy enough to recut/ reconstruct ( if you know quilting). If not, l suggest you chose the least damaged area & make that into a wall hanging , or frame it as art.Some day those 50's fabrics WILL be older and valuable, if kept long enough. Applique flowers over the holes and sprinkle a few more over the quilt top at random, especially in places that might be looking a little thin. That way it looks like a design feature rather than a repair. This is just my personal opinion, but I would wrap that up some way to preserve what's left of it and tuck it away as a lovely memory to be taken out and shown. Then, because it's so darn pretty, I'd do everything I could to recreate it as close as possible so it can be used. I think the holes throughout the background, sashing, and cornerstone fabrics indicate the fabric has "rotted" and is not sturdy enough to applique on or salvage in any meaningful way. 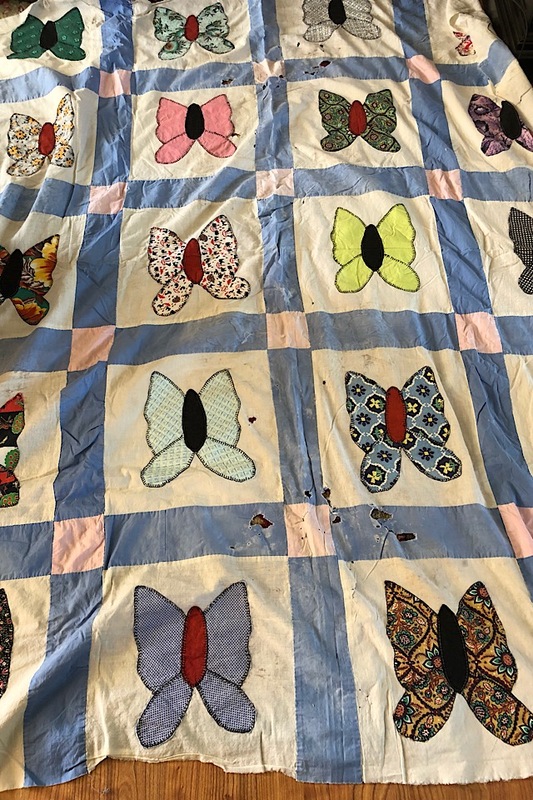 I would find similar colored fabrics and cut out the butterflies (since they seem intact) make a similar looking quilt w/the new fabric and the butterflies. I agree with Tartan. It is exactly what I would do. Yep, I would cut squares of the butterflies and then make a "background" using new pale blue and pink fabrics. I would applique the squares onto new fabric perhaps reinforcing them with backing just in case they are "holey" or weak fabric too. I would check all the fabrics first and see if they are "sound" or "iffy" or "very weak"
I found some blocks my Mom had made - and they just tore more easily than bathroom tissue - and they were maybe from the 1950s or 1960s. I think they were a poly-cotton blend. They looked "fine" - until I tugged on them. It looks like the most damage is in the sashing. The butterfly blocks look fairly salvageable. If it were mine, I would remove the blue sashing and save as much of it as I can and sash with some other fabrics and put the blue fabric as corner stones between each sashing. I am sure you will get a lot of advice on this board and good luck to you. Yes-it is salvageable for sentimental reasons for sure. I assumed the holes were from mice. If sort of funky, a good airing in sunshine might work wonders. I also think sunshine is a great disinfectant. Then press it - that might give you a better overview of how much damage there is. After you see how much there is altogether - then show us some more pictures and you will probably get more suggestions. It appears that the butterflies are all in relatively good condition. Could they be cut from the quilt top and re-appliqued on new fabric? It is a beauty, and I can both see and understand the desire to save it. I agree with Nanny's dollface, Prism99 and IceLeopard. Anything to preserve the original. It's a beautiful quilt top. Your mother will cherish it no matter what you decide. Good luck. I would also cut the butterflies out and appliqué them to new old looking fabric. I think I would try to unstitch each butterfly and restitch them to fabric similar to that previously used. It looks like a blanket stitch used. I was thinking appliques too; smaller butterflies and some small flowers along with the bees and hive. Be sure to show us the end result. You can do this. The damaged fabric looks too fragile to salvage. I too agree that the butterflies should be very carefully cut out and re-appliqued to new vintage looking squares. To me those would be the most precious parts to preserve. The addition of a label giving tribute to Grandma would also be nice. If it were me, and for the sentimental value. I would take off all the sashing. Then carefully iron the butterflys out. Then, I would stabilize the Fabric the butterflys are on with a medium weight stabilizer. I would then, put on a new borders in the color that matches the original color. And, then have it quilted. Even with all the age and wear, it will be a beautiful quilt. And, a beautiful memory of your DGM.